This personalized pillow is a tribute to a legendary little person in your life. 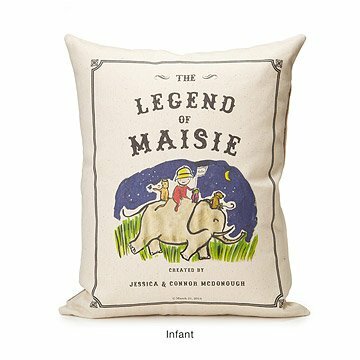 Cast your favorite little person as a legendary literary figure--whether a newborn making a debut or a young child in the first few pages of his or her legend--with this delightfully personalized pillow, featuring custom, storybook-inspired illustrations on each side and your custom rave "review." For newborns, it's an imaginative antidote to ordinary birth announcements; for young children, it commemorates the magical story of early childhood. For all, it's a soft, safe, and huggable tribute to each child’s precious individuality. The charming illustrations by Patricia Carlin evoke timeless storybook classics, creating a unique and memorable custom pillow that will transition from nursery to bedroom to grown-up keepsake. Customize the character to reflect your child of choice--newborn or child (skin tone for all, plus gender and hair options for older kids). The parents' names as displayed as "authors" of this little masterpiece. Write a review of your little one's story (by you or another doting relative) to add an imaginative and endearing touch to the additional artwork on the back of the pillow. Made in Brooklyn, New York. For more storybook titles, check out our Personalized Storybook Pillow - Adventure, Personalized Storybook Pillow - Brave, and Personalized Storybook Pillow - Amazing. Prefer your art as a print? Take a look at our Personalized Storybook Art - Amazing, Personalized Storybook Art - Adventure, Personalized Storybook Art - Brave, or Personalized Storybook Art - Legend. 3+; do not place in baby's sleep environment. For best results, dry clean only. Cover can be machine washed inside out on cold setting; lay flat to dry. Very unique baby gift that I would purchase again. This is one of the most unique baby gifts that I have seen as this is something that will last and not be outgrown and is a beautiful reminder of a child's birthday. This is such a sweet idea. My only comment would be I wish the product had even more customization, like adding more quotes to the back or changing the text on the bottom or changing the text of the "story" on the back. My wife said it was her favorite Xmas gift! Adorable and a perfect addition for our granddaughter's playroom! Seller was fantastic during proof stage. Worth every penny! Very unique and cute pillow. It is a good size and seems durable. It'll look great on the chair in my nephew's room and it'll be something he keeps for a long time. I loved the elephant design as well. A perfect gift for those wishing to give something unique! Exactly as presented on the website. I got this for the baby who has everything. It was perfect. It was completely unique. The artists were meticulous and communicated well to make sure everything was perfect. This was a first Christmas present for my great-niece, and it exceeded all my expectations. It was fun to customize, and I was delighted with the final product. I am certain my nephew, his wife and new daughter will enjoy it for a very long time.